The skins with which skin-on-frame boats are covered differ considerably from place to place, and even from boat type to boat type within a geographic area. The angyapik (umiaks) of St. Lawrence Island, Alaska, just south of the Bering Strait, are covered with the hides of female walruses. Removed from the carcasses after the spring hunt, the hides are stored until the hunting season ends in June or July. Any flesh or blubber that still adheres is then scraped off, then the hide is folded up into another old skin and left in a warm place for several days or weeks. This "sours" the skin so that the hair can be scraped off easily. The edges of the skin are split 1"-2" (2.5-5cm) deep, then holes are punched into the blubber side and the skin is hung and stretched on a vertical frame. The skin is then split from the top down with an ulu-type knife, great care being given to maintaining equal thickness on both sides. The two halves are not separated completely: they are left attached all along the bottom edge, so that the hide can be "unfolded" to cover very nearly twice its original surface area. It is then stretched and laced onto a larger, horizontal frame and left to dry for two to four weeks, after which is is soaked for up to a week in fresh water just before it is laid over the upturned hull with the blubber and hair side facing inward. The blubber-side half of the split hide goes bow-first, it being considered better able to resist abrasion from floating ice than the hair-side half. Women, by the way, do all the hide preparation and sewing. The walrus hide has been split but the two halves remain attached. (See the raised line along the center, just to the right of the center timber.) It will dry on this stretching frame for several weeks. Fully-skinned angyapik of St. Lawrence Island, Alaska. Two full skins are sewn together amidships in a straight seam. Also visible are ridges halfway between the center and the ends, where each split hide remains attached. 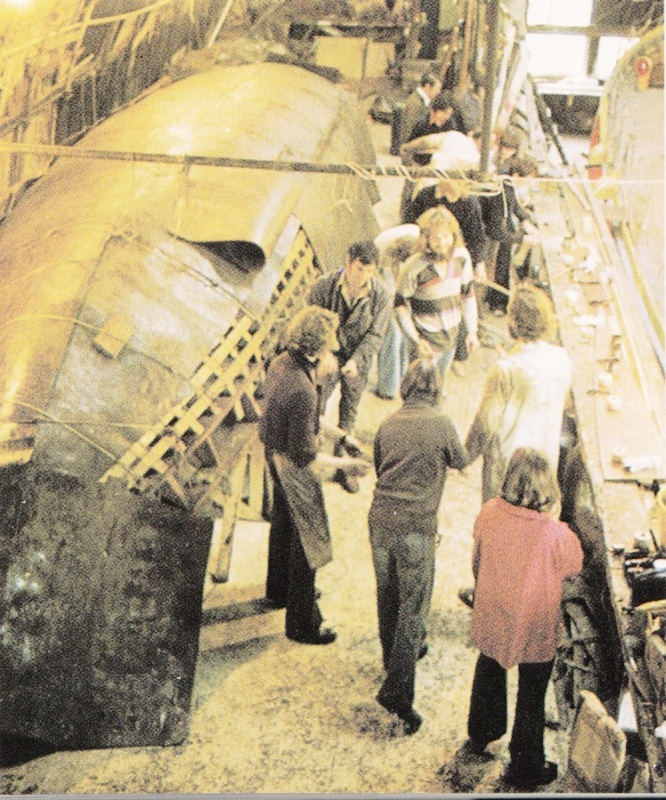 Note the large side panel, required to make up the full width of the hull. 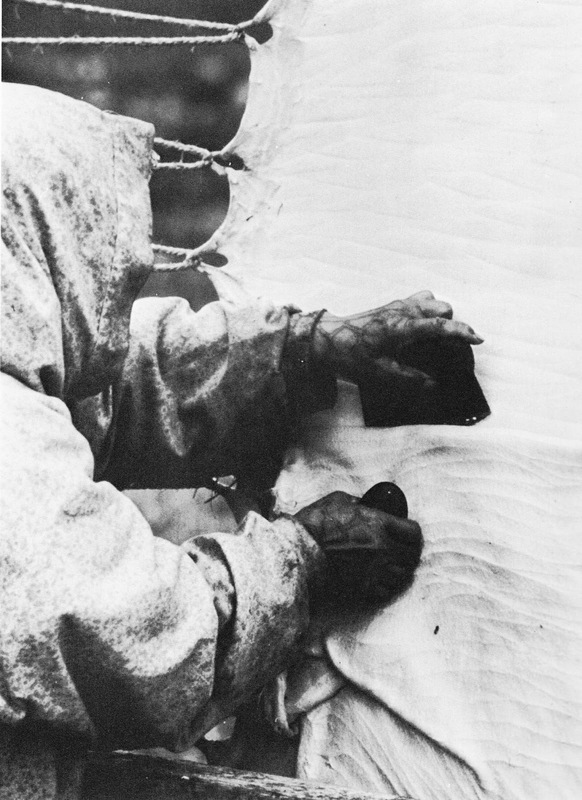 To sew the hides together, women use thread made from whale or caribou sinew. For the main hull seams, they use a blind waterproof stitch in which the thread does not completely penetrate either of the pieces. With the two pieces overlapped by 1"-2", the needle is inserted into the side-edge of one piece then down into the underlying piece, where it takes a U-turn within the thickness of the hide before emerging just outboard of the top piece's outer edge. The same procedure is followed on the opposite side, for a double row of waterproof stitches with no holes through the hide. Half a world and perhaps 1,000 years away is the leather-covered curragh used by early Irish Christian missionaries, as reproduced by Tim Severin in The Brendan Voyage . 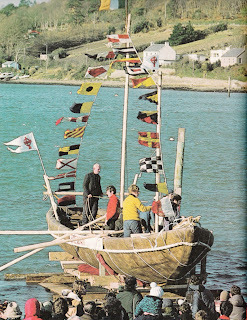 While it's impossible to know the real details of the boat used by St. Brendan (c.489 - c. 570 or 583), Severin conducted careful and persuasive research in attempting to recreate the type of boat that might have been used to cross the Atlantic long before the Vikings. What he concluded as the most likely covering was ox hides tanned in oak bark solution and dressed with raw sheep's-wool grease (i.e., lanolin). As these 6th-century boats were made in and for the use of monasteries, I feel we can safely assume they were built entirely by men. Ox hides being installed on Tim Severin's curragh Brendan. Severin bought his hides from one of only two or three traditional tanners remaining in the UK in the mid 1970s. He observed the process by which hides were first soaked in a lime solution, then stripped of their hair with hand scrapers. They were then soaked for weeks in an oak-bark solution. After drying, they were dipped into a hot bath of wool grease, then laid out flat one atop another with more hot grease poured between each one. After soaking thus for weeks, the hides had taken up 30-37% grease which, I think, means that the weight of the hide increased by that amount. The 36'-LOA Brendan required 47 hides to cover. They were sewed with hand-twisted flax cord made of 14 individual threads and rubbed through a mixture of black wax, wool grease and beeswax. Although the needles pierced straight through the seams, the thread's grease coating, and the high grease content of the hides themselves effectively sealed the needle holes against water. On the trip across the Atlantic, seepage through the hull was never a problem. The differences in materials between the umiaks of Alaska and the curraghs of Ireland imposed significant differences in usage. Because the umiak skins are neither tanned nor dressed, their waterproof performance is extremely limited. 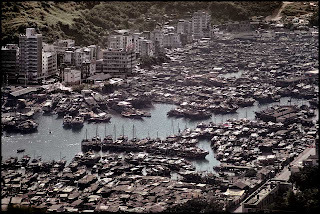 They must be removed from the sea every day and allowed to dry, or they will become quickly waterlogged. This will promote rot but, long before that happens, the skins would become too weak to maintain any integrity, and they would simply fall to pieces. This being the case, the umiak/angyapik is strictly a coasting vessel. 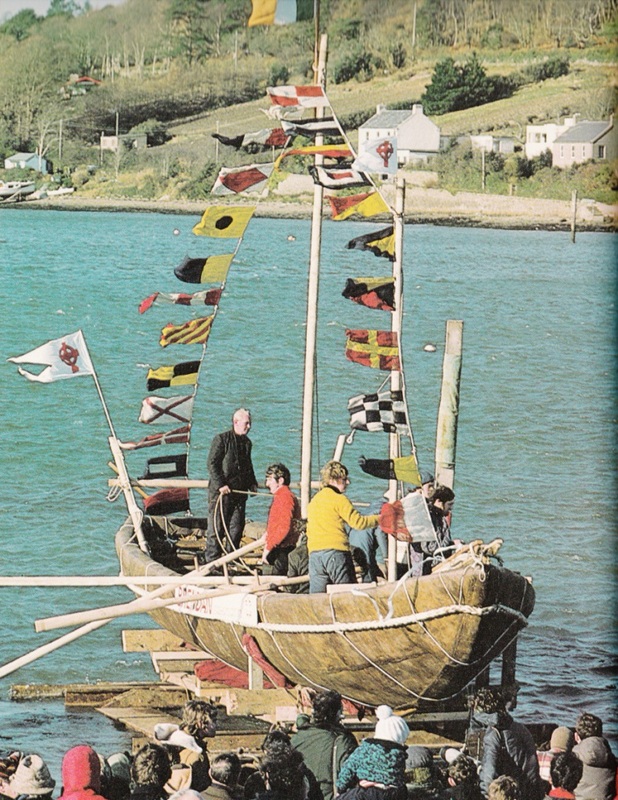 Although trips lasting several weeks might be undertaken, the crew must land each evening to dry the boat's cover. 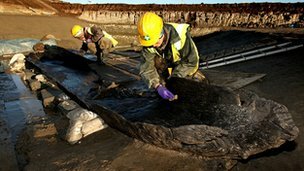 The curragh's leather cover, on the other hand, resisted both waterlogging and rot over a period of months at sea, at least in cold waters. (The Brendan voyage took the "stepping stone" route from the British Isles to the Faroes, and thence to Iceland and Newfoundland. Severin speculated that it might not have performed so well had a more southerly route been taken.) The leather-covered curragh, then, was a true ocean-going craft, capable of extended voyages and not requiring drying-out time. This post was inspired by a communication from Carlos Pedro Vairo, director of the Museo Maritimo de Ushuaia, Argentina, and author of The Yamana Canoe: The Marine Tradition of the Aborigines of Tierra Del Fuego . There's the usual nonsense about the artifacts being "perfectly preserved," when it's clear from the photos that the canoes, at least, did of course suffer deterioration: but that's not to imply that they were not sufficiently well preserved to be of potentially great archaeological value Unfortunately, the article includes no details about the canoes, but if you learn anything elsewhere, please leave a comment. Thanks again to Marian for this tip. 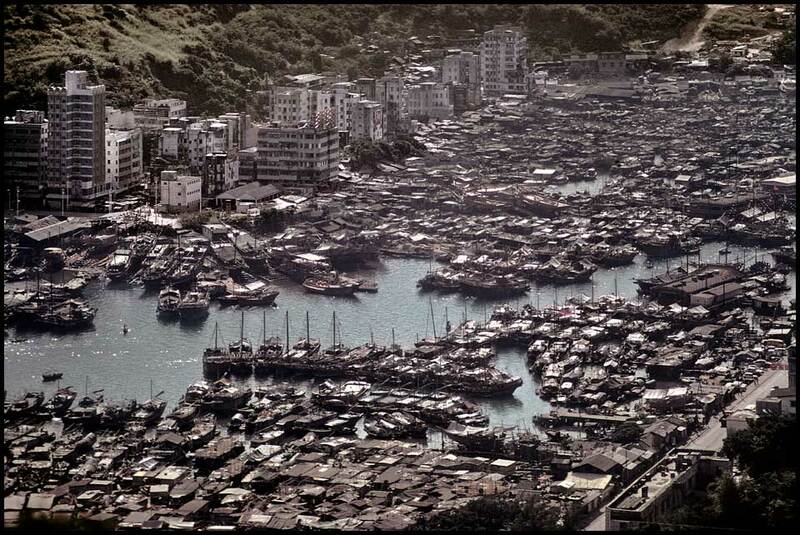 Just learned of this site, featuring hundreds and hundreds of photos of junks and sampans in Hong Kong, Macau and elsewhere, almost all from the 1970s. There's no easy navigation: you just scroll to the bottom of the page and click the link for the next one: there are nine pages in all. The number and variety of vessels shown is spectacular. Thanks to Marian (last name unknown) for this tip. Most of the others feature Euro-derived construction methods or designs, but even so, most of them are uniquely indigenous to Brazil. Well worth a visit. Kudos to author Jan W. Aten, and thanks to Silvio Antunha for the tip. Here's a lovely film, ca. 1949, showing the construction of a traditional Louisiana dugout pirogue. The 14 minute film was shot in 35mm by filmmaker Robert Flaherty, who was working on "The Louisiana Story." To quote the "film facts," Flaherty "was searching for a small boat, or 'pirogue' for his young hero. Flaherty soon became aware that pirogue-making was a disappearing art. Finally, when he found Ebdon Allemon, a Cajun craftsman, he persuaded him to make the pirogue. It may well have been the last pirogue made in Louisiana. This is a record of that event." The cypress they felled was huge in comparison to the boat they built from it. It looks like they had to split and hew off much wood to get the boat down to the proper width. The hull was first hewed to its plan-view shape with the sides perfectly plumb. Then the waterline shape of the flat bottom was scribed, and the angled sides hewed from those lines to the gunwales. 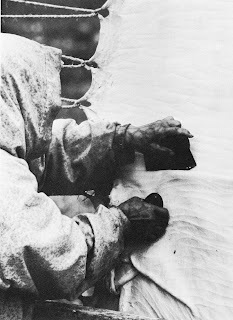 The hull was carved to its final shape: it was not "expanded" or widened, as is common practice in some other dugout building cultures, such as in this Siberian example. It appears that a single hole was bored in the hull amidships to monitor the thickness of the bottom. A stick is periodically inserted in the hole to monitor the thickness. This is unlike the process used in Siberia, where plugs of a fixed length are inserted into multiple holes from the outside, and the interior is hollowed until the plugs are revealed. Much care is given to producing thin hull with consistent thickness and a smooth and fair surface. Profiles are lined out carefully. Razor-sharp adzes and axes are used with great care, and are followed by careful use of planes, with one man putting his eye right against the surface of the hull to sight for high spots and directing the other man's use of the plane. Canoes this small are often propelled with a double-bladed paddle, but the single-bladed paddle is used here. Perhaps this is because pirogues are often used in dense vegetation and very narrow channels, where a double-bladed paddle would get hung up? 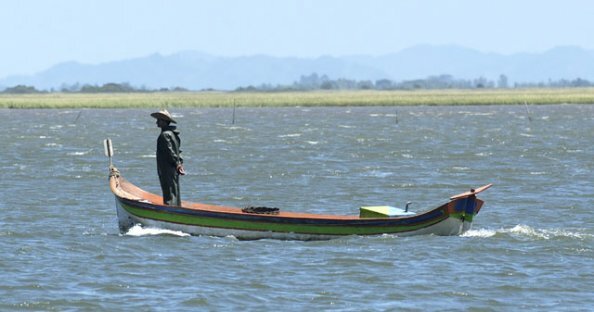 at 2:40 a pirogue being paddled rapidly by a man sitting well back in the stern, causing the boat to "porpoise." at 2:48, an interesting oared scow. Thanks to the blog FrancoAmerican Gravy for passing this link to us.